Mr K Shanmugam met Myanmar’s opposition leader and nationalist Aung San Suu Kyi at her residence in Yangon (formally known as Rangoon). Singapore Minister for Foreign Affairs and Law has reaffirmed theties between Singapore and Myanmar, during his meetings with Myanmar (formly known as Burma) leaders and opposition leader. The Minister visit follows the recent meeting between Ms Aung San and U.S. Secretary of State. 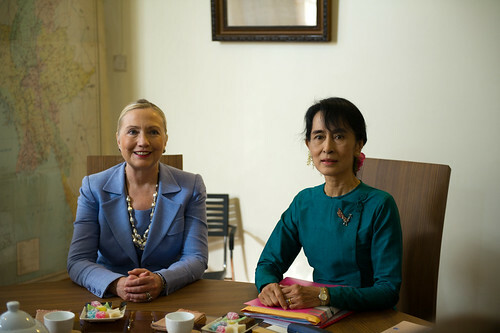 U.S. Secretary of State Mrs Hillary Clinton visits with Daw Aung San Suu Kyi at her house in Rangoon, Burma on 2 December 2011. Burma is a potentially mineral-rich country in transition.